Novelist Stegner tends to identify with writers like himself: westerners who try to forge a literary identity far from the East Coast establishment. Like Walter Clark (see above), Bernard DeVoto—novelist, critic, historian, editor—was an outsider both in his native Utah (where he was baptized a Catholic) and in the East, despite his Harvard education. 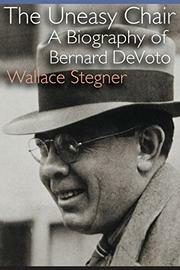 When Stegner’s biography first appeared in 1974, Kirkus didn’t appreciate how much Stegner personally seems to have invested in his life of a writer we thought unworthy of his superior talents. “A thoroughly agreeable book about a thoroughly disagreeable” man Kirkus put it: “an exhaustive biography of such a minor literary personality.” But Stegner’s “valentine” to his friend also captures the times in which he thrived—it’s a remarkable look at the literary politics of an era, and a man who found himself at its red-hot center. We wondered “why Stegner cares so much,” but in retrospect, the answer seems clearer.